Lose a drive? 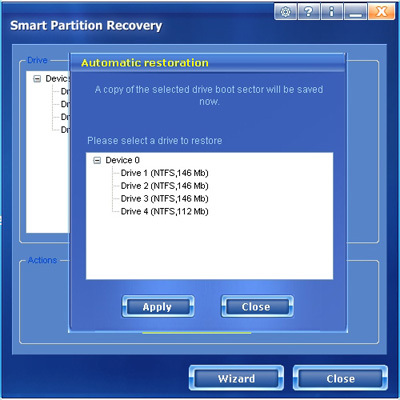 Smart Partition Recovery will restore it! When Explorer does not find a disk, this does not mean that the data has been lost. The data is OK most of the time, but a disk boot sector is damaged. 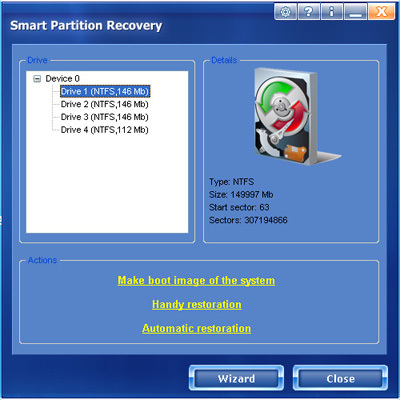 Smart Partition Recovery restores deleted logical disks. In an automatic mode, Smart Partition Recovery will easily make it possible for you to restore access to the lost sector. You can also use the “Make boot image of the system” option to make a copy of the disk boot sector as a set of files, and later you can use this copy in case of data loss. The saved files can be stored on a floppy disk, flash-drive or CD. In a manual mode, you can re-record a disk boot sector with our file. This may be a pre-recorded copy or a copy of the boot sector of a similar disk with a comparable size and file system recorded on your PC or another computer.